Friday June 28th 1901 Busy with the house-work all morning. Ida and I went down town in the afternoon, stopped at home a little while but found the girls away. Our boys were putting up hay at Woolfs. a hot wind today. Saturday June 29th 1901 Did our work in the forenoon and I slept all the afternoon. 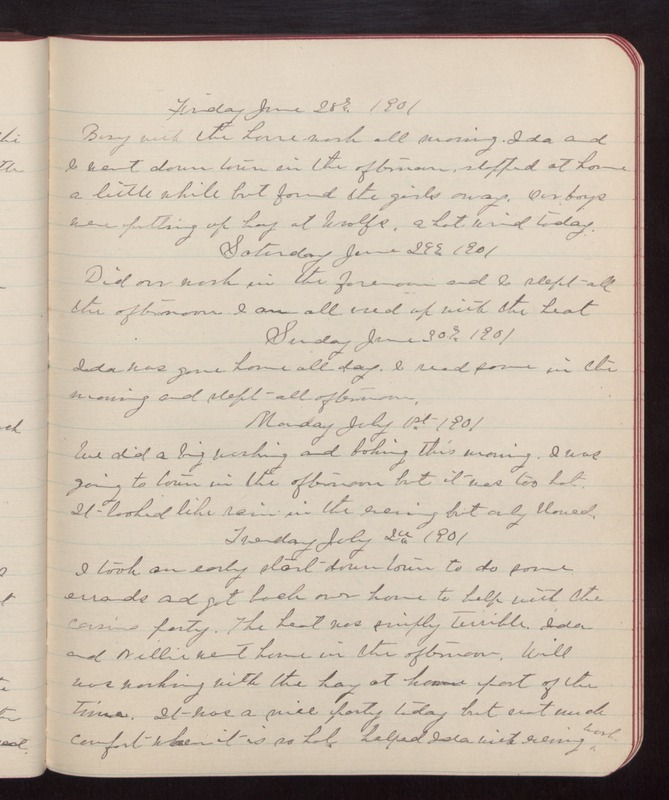 I am all used up with the heat Sunday June 30th 1901 Ida was gone home all day. I read some in the morning and slept all afternoon. Monday July 1st 1901 We did a big washing and baking this morning. I was going to town in the afternoon but it was too hot. It looked like rain in the evening but only blowed. Tuesday July 2nd 1901 I took an early start down town to do some errands and got back over home to help with the cousins party. The heat was simply terrible. Ida and Nellie went home in the afternoon. Will was working with the hay at home part of the time. It was a nice party today but not much comfort when it is so hot. Helped Ida with evening work.